1-13-2 The coaching box shall be outlined outside the side of the court on which the scorer’s and timer’s table and team benches are located. The area shall be bounded by a line drawn 28 feet from the end line towards the Division line. At this point a line drawn from the sideline toward the team bench becomes the end of the coaching box going towards the end line. Effective Immediately. Tape may be used to extend the 14-foot line to 28 feet Rationale: The restriction of the coaching box penalizes the level of communication between coach and player. Allowing a coach freedom to move within the new box between the 28’ mark and the end line provides a coach more access to coach his/her players. 2-9-1 When a foul occurs, an official shall signal the timer to stop the clock. The official shall verbally inform the offender, then with finger(s) of two hands, indicate to the scorer the number of the offender and the number of free throws. 3-4-1d There are no color/design restrictions in the area of the team jersey from the imaginary line at the base of the neckline to the top of the shoulder and in the corresponding area on the back of the jersey. There are restrictions on what identifying names may be placed in this area (see Article 3-4-4). Rationale: Provide guidance on the forthcoming restrictions for this area of the jersey. 3-4-4 Identifying name(s) shall adhere to the following: a. If used, lettering with school name, school’s nickname, school logo, player’s name and /or abbreviation of the official school name shall be placed horizontally on the jersey. b. The panel in the shoulder area of the jersey on the back may be used for placing an identifying name as well. 4-48 NEW – Warning for Coach/Team Conduct A warning to a coach/team for misconduct is an administrative procedure by an official, which is recorded in the scorebook by the scorer and reported to the Head Coach: Art. 1 . . . For conduct, such as that described in rule 10-5-1a,b,d,e,f; 10-5-2; 10-5-4 the official shall warn the head coach unless the offense is judged to be major, in which case a technical foul shall be assessed. Note: A warning is not required prior to calling a technical foul. Art. 2 . . . For the first violation of rule 10-6-1, the official shall warn the head coach unless the offense is judged to be major, in which case a technical foul shall be assessed. Note: A warning is not required prior to calling a technical foul. Rationale: Stopping play and making sure that the bench and the coach know that an official warning has been given, sends a clear message to everyone in the gym and impacts the behavior of the coach, and in some cases the behavior of the opposing coach. 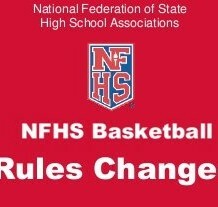 This change in behavior creates a better atmosphere and many times avoids the need to administer a technical foul.